to keep them healthy and happy. Here's a short list of tips for new llama owners. Don't buy babies younger than 6 months, and resist the urge to play "mom". Adorable as they are, baby llamas (called crias) are not suitable pets - they would be much better off with their mothers until they are fully weaned, and most reputable breeders will not sell crias under six months of age. Cuddling is off limits; keep physical human contact to a minimum. An adult llama bonded to a human from near-birth without proper herd socialization could be dangerous when it naturally treats the human as another llama. 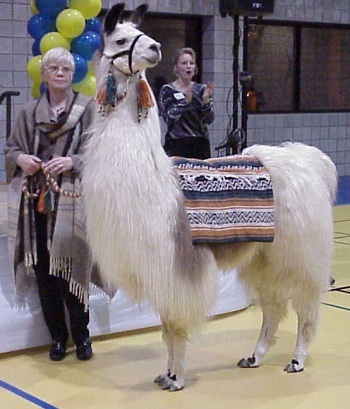 Seek information from knowledgeable reputable breeders like Leisure Acres Llamas or from your veterinarian. Llamas should not be left in halter all the time. Llamas must be trained to accept a halter, but leaving your llama in halter all the time is both cruel and dangerous. It can result in abscesses, ulcers, and calluses at the very least. Learn to halter your llama when it is necessary and remove the halter when the event is over. Llamas must be fed reasonably. Non-breeding llamas fare very well on free choice hay, adequate pasture, fresh water and free choice loose minerals. If they are breeding, underweight or lactating, supplement them with a feed formulated for llamas. Whether you feed your llamas grain or pellets, be sure they have free access to a source of salt and minerals. Heat and humidity are adjustments for llamas. Llamas don't handle heat or humidity well. They must have shelter from direct sun and they need fans or some kind of air movement if their shelter is enclosed. Llamas are happy to have a hosing or bath when the heat is oppressive, and those with heavy wool need to be sheared in the spring. Some plants and trees are poisonous to llamas. Llamas are browsers and like to eat a variety of plants. Unfortunately, some vegetation (like rhododendron and wilted cherry) are very toxic to llamas. A list of toxic plants and trees is available - check with any of the associations devoted to camelids. Llamas don't like to be alone. One of the most endearing llama traits is their intense attachment and concern for each other. Never buy a single llama to be kept without any other llamas; add a llama to an existing herd or buy them as a pair. And expect some eccentric behavior if a pair is separated; if you take just one of them out of their enclosure, the one remaining may become extremely agitated and may even jump the fence in an attempt to rejoin the other. Keep them together to keep them happy and healthy. Llamas need shelter and fencing. Llamas need protection from wind, snow, rain, sun and lightning. Fencing is also necessary, but fencing appropriate for any kind of livestock of similar size should be adequate. Never use barbed wire, which can easily injure their eyes or skin. Male llamas must be handled correctly Males close to 1 year should not reside with females, and young females should not reside with males of any age. By about two years of age males develop very sharp upper and lower fighting teeth. If untrimmed, these teeth can cause serious damage to other males (and/or to an uncooperative female). Consult your veterinarian about removing the tips of your male llama's fighting teeth. Llama pens must be kept clean and free of "stuff" Llamas are curious. They explore everything. Don't leave potentially dangerous lumber, wire, baling string, machinery parts, and farming implements where llamas can reach them, get tangled in them, or chew on them. Take a tip from the Boy Scouts... be prepared Have a plan for every contingency. Talk to your vet or an experienced friend (like the folks at leisure Acres Llamas) who can tell you what to have in a first aid kit. You can control feelings of panic in an emergency by knowing that you have searched out good informationb and are prepared with the tools you will need. It could save your llama's life. Llamas have amazed veterinarians and practiced livestock breeders with their hardiness and resistance to disease. However, since they are stoics, as well as being hardy, when a llama manifests symptoms of distress, it's usually serious. Be ready.